A lot has changed since ASAP Aquatics was founded in 1996, but what’s stayed consistent are the principles guiding our work. Service, Honesty, Results, and Pride form the foundation of everything we do. ‘Service First’ is the cornerstone of our philosophy, and we believe that an honest day’s work brings proven results. No matter what your water needs -we’re here to help restore its value, beauty, and usability. Scum, Moss, Seaweed, Grass -whatever you call your water’s Algae and Weed problems, we can offer a solution. In addition to being fully licensed by the Indiana State Chemist, we utilize industry-leading knowledge and equipment in combination with EPA registered products to achieve the best results in our treatment programs. Movement enhances the health and beauty of your water, but choosing the wrong equipment can be an expensive headache. Our staff will advise you on the right choices for your needs and guide you through the installation process. We’re also proud to be Central Indiana’s largest fountain and aeration service center, so you can protect your investment with seasonal winterization and maintenance by our certified technicians. Emersed plants are ones that break the water’s surface, like cattails and water primrose. Controlling these shoreline invaders, with their fast, dense growth can challenge even the most dedicated lake or pond owner. Our seasonal and customized programs offer stress-free alternatives for keeping your water looking great! Ponds get shallower with each passing day -leaves, weeds, algae, and other debris sink to the bottom thickening the growing layer of muck. Dredging is useful after 10-12 years of a pond’s life, but with costs ranging up to $90,000/acre, it’s extremely cost prohibitive. 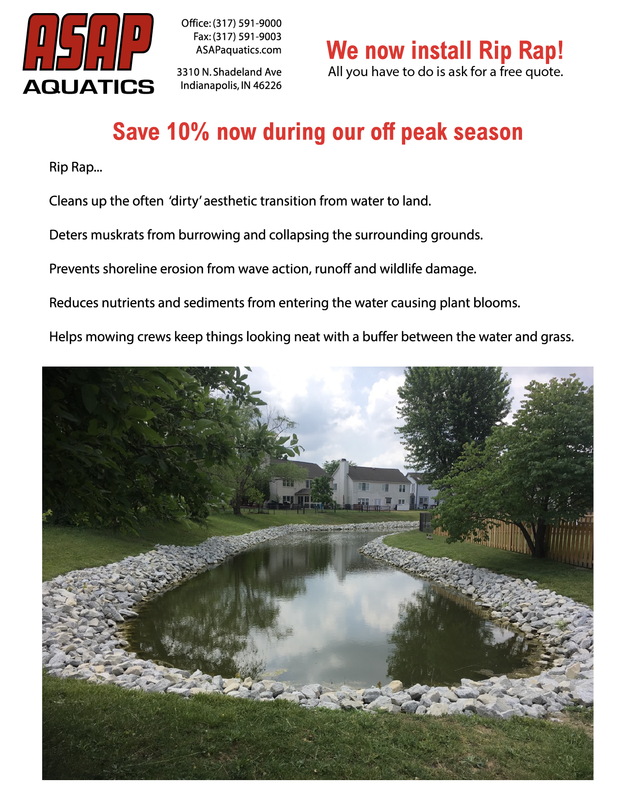 An easier, more affordable solution is our muck reduction program. Using a blend of natural, beneficial bacteria, we can help your pond safely and rapidly dissolve up to 2″ of organic waste per month. 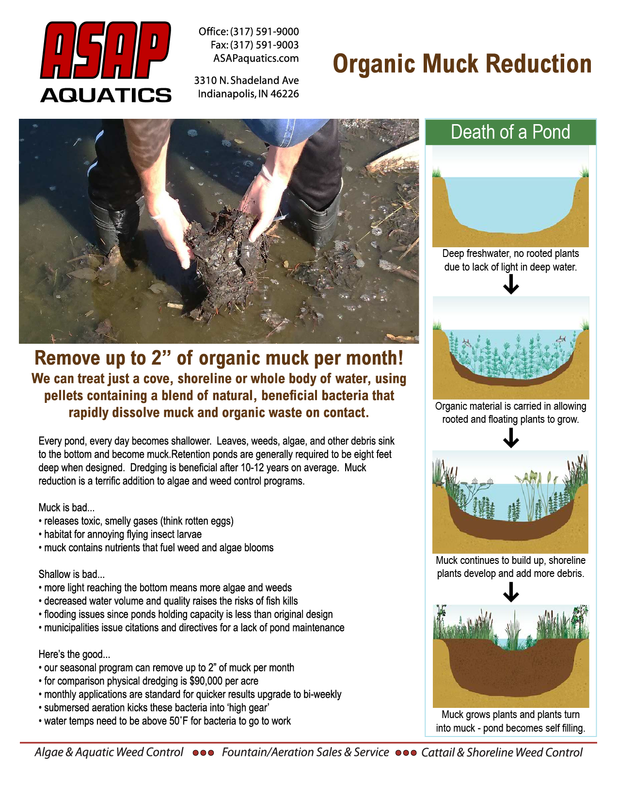 Muck reduction is a terrific addition to an algae and weed control program, so start planning for your pond’s future today! Improve the stability and aesthetic value of your shoreline with rip rap. Not only does this hearty stone border help prevent erosion by slowing the flow of runoff; it reduces the volume of bloom-causing nutrients and sediment entering the water. A clean, solid edge also deters muskrat burrows and serves as a great guide for mowing crews. Let us do the heavy lifting while you enjoy the benefits!